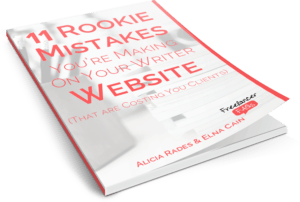 Do you have a freelance writer website? If you just started creating one, it can be a confusing process. You’re already pulling out your hair trying to figure this whole design thing out. On top of that, you have to decide what type of content to include. With so many things going on at once, it’s easy to forget something. You don’t have to fret any longer! Below, we give a quick checklist detailing what you should include on your writer website as well as tips on how to develop those elements effectively. It goes without saying that you need home page copy, but right now, writing effective home page content is what you need to focus on. Focus on your client. Talk about how your services can solve prospects’ problems. Since you’re an individual–as opposed to a business entity with employees–it’s a good idea to have a photo of yourself somewhere on your website. It helps clients get a feel for who you are, it makes working with you feel more personal, and it helps brand your business. You don’t have to spend hundreds of dollars on a professional photo session, though. (For years, I used a headshot that I took in my bathroom.) Just be sure you’re taking a photo with a decent camera instead of your web cam, and try to get a good background in the shot. Once you have your photo, the question is where to place it. I always tell writers to put a photo on their home page, but depending on your theme and your copy, you might choose to place it in your sidebar or on your about page. At the very least, it’s worth putting a head shot on your about page so that when prospects want to learn more about you, they can put a face to your name. Elna Cain of Innovative Ink wrote a fantastic about page on her website. Instead of starting with something like, “Hi! I’m Elna, freelance writer,” she immediately makes it about her clients. Then she goes into details about herself all while focusing on how she’s the person who can help solve that problem. My high-quality content is search-engine friendly and social media friendly and it helps businesses save time. I’m not saying absolutely everything on your about page must be client-centered. I’ve seen a lot of writers who add a “fun facts” section at the end of their content (I also do this), and that tends to be a fun and effective way to put some more personality into your copy. Your portfolio is what’s going to highlight your experience and prove to prospects that you have what it takes to work for them. With access to your portfolio, clients can see what your writing is like and use this to decide whether to hire you or not. Use a portfolio-building tool like WEBPyshiology Portfolio. That’s is what I use, and I know of a lot of other writers who also use it. Using a testimonials-building plugin. I’m currently running with the Client Testimonials plugin for WordPress. Obviously prospects need a way to hire contact you or you’ll never get hired! How often do you have to update it? It doesn’t have to be a daily ordeal. I update my blog bimonthly, and that seems to work for SEO purposes. You can certainly update yours more often if that works for you. Some people will say that a newsletter subscription form is a must for any website, but I put this in the “optional” category because I don’t think stagnant sites really need a newsletter subscription form. I do think it’s a good choice if you have a blog, however, since your readers are always looking for more content. I almost always click away from business websites that don’t list rates. I don’t want my site to have the same effect. It keeps people with super tight budgets from contacting me and wasting both our time. But I get it. Some people think rates will scare prospects off, and other people offer such a variety of services that it’s nearly impossible to list an approximate rate without talking with clients first. If you need more personalized advice on your website, leave us a comment with your site’s URL, and we’ll help you get to where you need to be. Do you see me blushing? Thanks for including me in your post! I’m honored that you feel my About page up to par! I’m enjoying all the useful information this blog has for novice writers. Thanks for making this blog. No problem! I absolutely adore your writer website. Blush a little more lady :). I like your website a lot, and now that I’m in the process of working on mine, I’ll be studying yours very carefully. The points you have mentioned here are unbelievably Stupendous. I am just about to create my professional writing website and these points will surely help me enormously.